Today we’ll take a look at how to create some 3D extrusions, particularly 3D text, using the free Dojo Extruder Script. 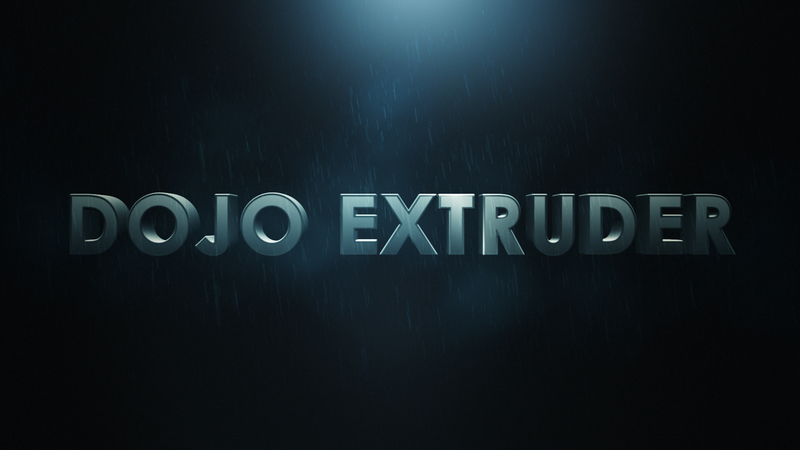 With Dojo Extruder, you can easily automate the creation of pseudo 3D extrusion with a click of a button. This is a great free alternative for those who don’t have Element 3D or other 3D plugins for After Effects. It’s also a great way to achieve 3D looking results for use in template creation if you do not want to use Element 3D in those projects. By precomposing your source text layer/logo, you’ll be able to swap and edit the source and have the extrusion procedurally update. This is very useful if you don’t want to mess with 50+ duplicate copies! You can achieve some nice results by adding strokes, textures, and other fancy things in the source composition. If you’re getting pixelated results, try enabling motion blur or turn on collapse transformation/rasterization for all the source duplicates, as well as your text layer/logo in the source composition. Everything is parented to the control null, so use the null if you want to animate the position, rotation, etc of the 3D object. Don’t forget that everything reacts and works with AE lights! Throw in some lights to better light and shade the scene. Play around with the different text animators to get different results. If you guys have any questions or ideas on how to improve this script, let me know in the comments below! I have always a fascination for creating 3D text, though I am not good enough still now!! Again trying following your video. Thanks for the support Greg! first a big thx to you for the script! Based on your description, it seems like you don’t have “Allow Scripts to Write Files and Access Network” checked in the General Preferences. You’ll need to turn that on for most scripts as it allows scripts to write temporary files that will be required (Dojo Extruder deletes these immediately after script launch). Are you using the latest version of Dojo Extruder (v1.2)? My script usually prompts you to enable this option if it sees that it isn’t already turned on. thank you for qour answer. Actually i have this setting checked. I have the latest script installed. I think it has something to do with header-image, which is also not loaded after the error message is displayed. This is an amazing, Thanks for sharing !